The Tekko Metal AR Carbine Integrated Rail System replaces the plastic factory handguard in minutes and requires no gunsmithing. No permanent alterations need to be made to the rifle, its a drop in screwless installation, the unit is held in place by the Delta ring and handgaurd cap. 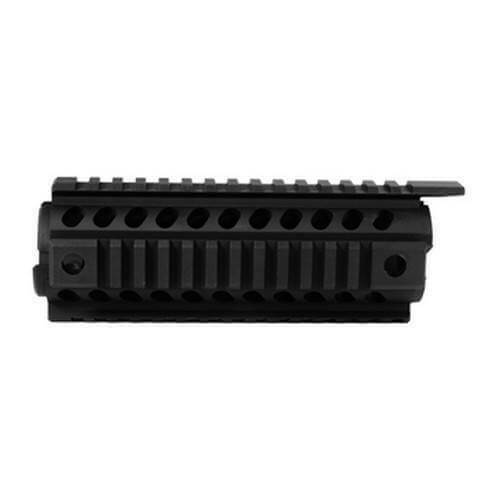 Four MIL-STD 1913 Picatinny Rails provide a secure platform for mounting Picatinny accessories such as vertical grips, lights, lasers, bipods and other rail mounted kit. A monolithic style continuous top rail eliminates the gap between the receiver and rail. The 7″ lightweight 6061 aluminum construction is hard coat anodized, made in the USA. Thank you for the exceptional service. Drops in place and fits perfectly. Ordered the wrong item originally and flawless, easy return. With a little assistance ordered the MFT Tekko 7" drop in. Fits perfectly and was a snap to install. Very well made and has a great fit and finish. This is a great addition to my new DPMS Oracle Ar-15. Thanks for the great service. Making my wish list now.